Our favorite holiday is back! Every year, February 3rd is set aside to celebrate this wonderful dessert and we’re celebrating with 50% off full and half slices of our Incredible Carrot Cake all week long from 2/3/19-2/9/19.! In honor of this very special day, here’s a little bit of history about our favorite dessert. 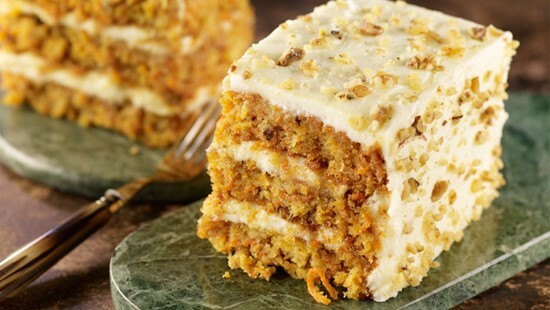 It is believed that carrot cake has been around since the Middle Ages. At that time, sugar, was hard to come by so people used sweet vegetables, like carrots, in place of sugar. As sugar became more readily available, people abandoned this practice of using sweet vegetables in their desserts until World War II when the British government rationed many foods, including sugar. In response, the Ministry of food, began promoting the use of carrots as a sweetener for desserts, and the love of carrot cake was born. Our signature dessert is made fresh daily from a family recipe that has been passed down from generation to generation. Chock full of freshly shredded carrots, pineapple, walnuts, and frosted with cream cheese frosting, our Incredible Carrot Cake is sure to please everyone’s sweet tooth. Ready to order? Order online now for quick and hassle-free ordering!